There is no better feeling than the achievement of cooking the centrepiece to your Christmas dinner perfectly, is there? The humble turkey - many of those cooking it have their own ways and means. Others have family traditions that get used year after year. But, what’s the best way? Here, The Ginger Pig, infamous for their love of quality reared meats and authentic recipes, give us their insight in to how to create the perfect bird this season. When you get your turkey home, take the vacuum-packed giblets out of the cavity, and rest the bird unwrapped on a large plate at the bottom of your fridge – don’t be tempted to wrap it in cling film, as this can make the skin clammy and encourages bacteria. If you’re not cooking your turkey for a day or two, it’s wise to use the giblets now. Make a simple stock using everything except the liver, and a few vegetables; this stock will keep 4-5 days if covered and placed in the fridge. 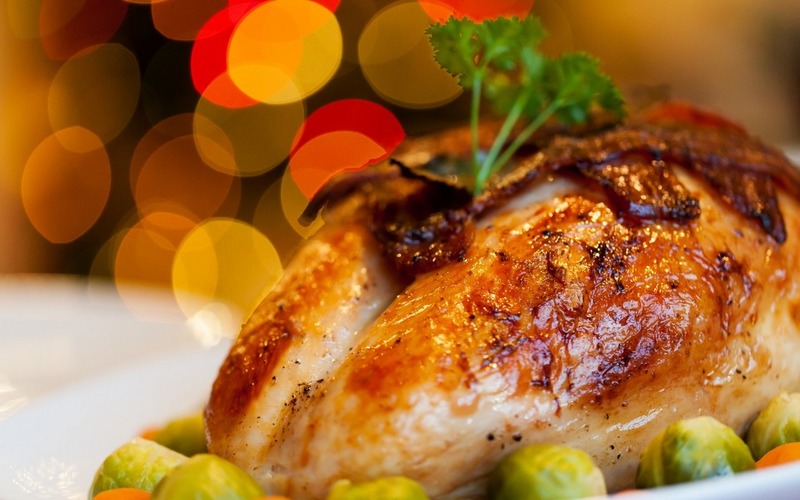 Take your turkey out of the fridge a long time before it goes in the oven – six hours should do the trick. If you only give it an hour or two then the bird will still be quite cold in the middle, and this is what leads to uneven cooking, meaning dry turkey or even worse – still raw in the middle. Rub the skin with plenty of butter and pepper and cover the breast with lots of streaky bacon. Make a big tin foil cross inside your roasting pan, place the turkey in the middle and wrap the foil around to make a loose but closed parcel. Cook at 220˚C/ 425˚F/ Mark 7 for 40 mins. Reduce heat to 170˚C/ 325˚F/ Mark 3 and cook for approximately a further 3 hours (small turkey), 3 1/2 hours (medium), 4 1/2 hours (large) and 5 hours (X-large). Uncover for the last 30 minutes and remove the bacon to crisp the skin. Stick a long skewer in the fleshiest part to test for doneness; the juices should run clear. Rest the cooked bird for a good 40 minutes while you finish preparing your side dishes. Use your giblet stock and some wine to make a proper tasty gravy. 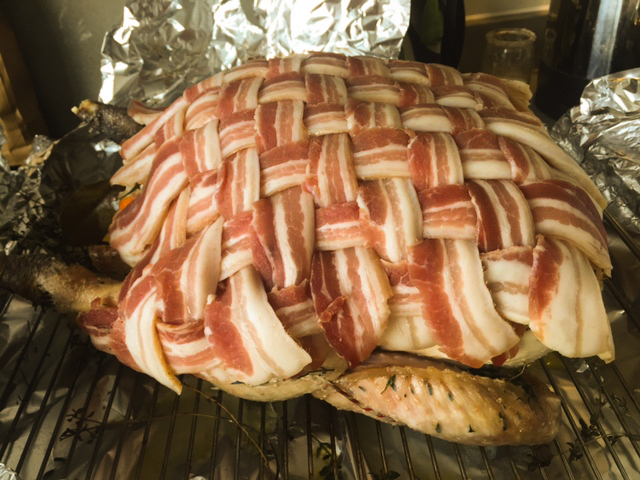 Why not add a little something extra to your turkey this year with a beautifully delicious bacon lattice? Not only will it look good, but the bacon will add a nice extra bit of texture too. Simply mix the ingredients all together and press in to a baking tray. Cook until golden. You could even roll the mix in to stuffing balls for an extra decorative effect. A tip from the boss (Tim Wilson) - Cook your stuffing separately from the turkey, otherwise you will dry out the bird in a bid to properly cook the stuffing inside.